Rooted in the Pacific Northwest, Kristin Vining grew up in Olympia, Washington. After graduating from North Thurston High School in Tacoma, she moved to Walla Walla, attended Walla Walla University and Whitman College, graduating from Whitman in 1998. Kristin teaches music at all three of Walla Walla's colleges. At Whitman College, Kristin teaches piano and accompanies and composes for dancers at the annual Summer Dance Lab. At Walla Walla University, Kristin teaches piano and coaches piano ensemble, working with her college piano instructor, Dr. Leonard Richter. She also accompanies vocal students of Dr. Christine Janis and Jeremy Irland at their weekly voice class. At Walla Walla Community College, Kristin accompanies, coaches, and composes for students in Julie Jones' voice class and vocal ensemble. 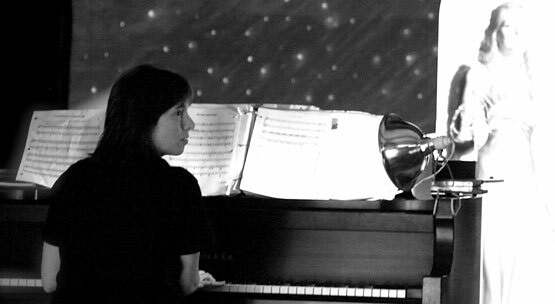 She also teaches Music Fundamentals and Women as Composers at the community college. Women as Composers is directly inspired by the dedicated work of Dr. Susan Pickett at Whitman College. Kristin is an avid and active composer, inspired to write for her students, singers, dancers and friends in the Walla Walla community. Working with Patrick Henry, professor emeritus of Whitman College's French department, Kristin discovered Madeleine Dreyfus, a Jewish rescuer of Jews during the Holocaust, and wrote a set of pieces directly inspired by Madeleine's story. These pieces were then choreographed by John Passafiume, director of Summer Dance Lab, and performed by students from SDL. Kristin has written two operettas for students at WWCC: "Cendrillon,' a Cinderella story in French, and "Cartes Postales," musical postcards set in Paris. Kristin wrote "Alice," an original operetta inspired by Lewis Carroll's books, for the 2011 Opera Camp Workshop held at Walla Walla High School, directed by the late Brian Senter. Also for Walla Walla High School Kristin composed original music for a production of "Pride and Prejudice." In May 2011, the Walla Walla Choral Society—directed by Dr. Christine Janis, accompanied by Kristin Vining, and joined by singers from WWCC and College Place Village Church—premiered "Litanies," a set of Latin prayers written by Kristin for the group to perform. Kristin's upcoming projects include more operettas and original music for dance.